Approaching Nox Craft Cocktails & Comfort Food in Village Gate, you may think you need a password to enter. The impressive, dungeonesque doorway has eye-level panels that can be opened from the inside to snoop on who is outside. When my friend and I stepped inside on our visit, she immediately gasped, "Oh my goodness, Sherlock Holmes." The place does indeed resemble the televised version of the detective's apartment interior. I began to sense a theme: Nox is a self-proclaimed "nerd pub." Nox was opened at the beginning of the year by James and Corinne Black, Aaron and Kelly Metras, and Tom Snape. (Aaron and Kelly Metras are the owners of Salena's and James Black worked there for 10 years.) "We have a bunch of degrees between all of us and we're all enthusiastic about learning." Names from literature, film, and television make up the food and cocktail menus. In fact, the name "Nox" is the Latin word for "night" but is also the wand-extinguishing charm from Harry Potter. 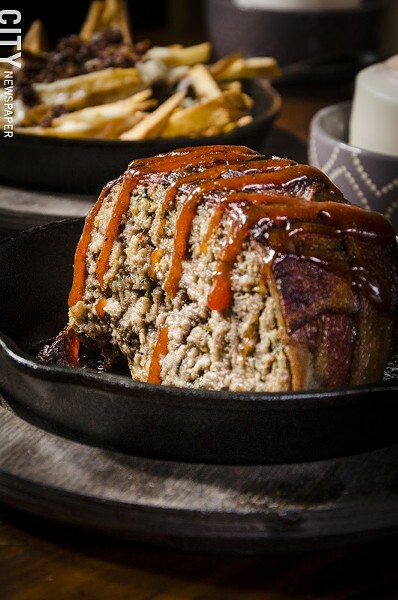 At the end of your meal, your check is delivered in a hollowed-out book. For the menu, Black wanted something more than typical pub fare – "basically anything that's not a chicken wing." 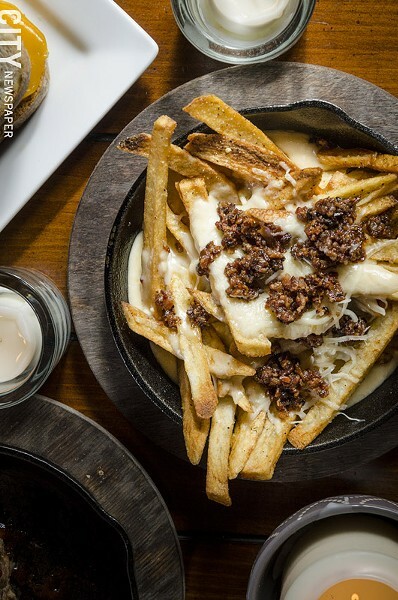 Chefs Brett Blotnik and Dave Yellow are in the kitchen creating comfort cuisine like the Noble House of Black Mac & Cheese ($9), elbow noodles swimming in a mixture of Asiago and Oaxaca cheese, topped with Cheez-Its, bread crumbs and bacon bits. The Snack of Vlad Dracul ($7) is a Hungarian wax pepper stuffed with Feta, Parmesan, and cream cheese and sausage, served on a slice of sourdough bread from Baker Street bakery. Nero's Second Breakfast ($6) combines seedless red grapes that have been fire-roasted with olive oil and rosemary with mild Brie and local creamed raw honey, served with sliced baguette. 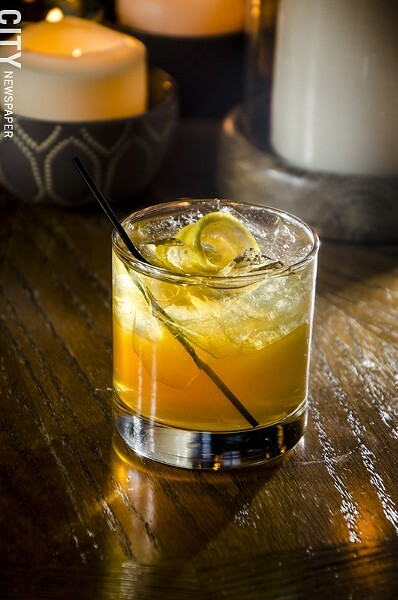 Black is fascinated by the history of alcohol, and the cocktail menu at Nox is innovative and extensive. His favorite drink on the menu is the Bukowski, a mixture of Riverboat Rye Whiskey, Yellow Chartreuse, Fernet Branca, and a whole-leaf tobacco syrup. Nerd alert: there are Easter eggs on the Nox website that unlock secret menus. Nox Craft Cocktails & Comfort Food is located at 302 North Goodman Street in Village Gate, and is open Thursday through Monday, 4 p.m. to 12 a.m. 471-8803. Visit their website at noxcocktail.com. The Old Toad (277 Alexander Street) will host a Bourbon Barrel Aged Beer Tap Takeover on Saturday, January 31. Sample trays will be available and the draft lineup will be released closer to the event date. Check out their Facebook page for more details. Ever dream of opening your own craft distillery? Black Button Distilling will offer a three-day distilling course, "The Craft Distilling Experience," February 6 through February 8. The course will be led by the distillery's president and head distiller, Jason Barrett, and is meant for people who already have a basic understanding of spirits and is "recommended for spirits lovers and entrepreneurs seriously considering opening a craft distillery." Enrollment in the course will cost you $950, and breakfast and lunch is provided. More details: blackbuttondistilling.com. Swiftwater Brewing has opened at 378 Mt. Hope Avenue. The farm brewery-brewpub is open Wednesday through Sunday. More details can be found on their Facebook page. Blue Toad Hard Cider has opened at 120 Mushroom Boulevard, Suite 105. Their tasting room is open Thursday through Sunday. Infantino's Market Restaurant (2133 East Henrietta Road) and Blue Cactus Mexican Grille (5 Liftbridge Lane, Fairport). La Tea Da (258 Alexander Street) has suffered a debilitating fire and will be closed until further notice. The owner hopes to reopen. EDITOR'S NOTE: This article has been updated to correct the names of Tom Snape and Brett Blotnik.